3 Billion Colony Forming Units per BIO-tract pearl - which is equivalent to 45 Billion CFU (colony forming units) of standard probiotic capsules! Drama Free & Easy to Swallow. This very tiny pearl is easy to swallow for most children ages 4 and up. PRO-Kids pearls are most effective when swallowed rather than chewed, though still taste great if chewed! They can also be hidden in food or even crushed and then mixed with cold foods. Naturally Derived Prebiotic included in each pearl to help feed the probiotic for increased potency and effectiveness. Prebiotics are basically fibers that encourage the growth of beneficial bacteria throughout your colon. Long Shelf Life & No Refrigeration Necessary. With the patented LiveBac manufacturing process, our formulas have an extended shelf life with zero refrigeration. Only Once per Day. That's it. Because with time-release delivery, the full benefits are being delivered deep inside your child's gut hour by hour. Made in the USA. Our probiotics are homegrown with care in Washington state, then tableted in Colorado in a facility that is GMP certified through NSF. We adhere to the strictest quality control and FDA guidelines and perform rigorous testing on every lot to ensure they are effective and as the label states. Natural Probiotic Supplement. At Hyperbiotics, we don't believe in artificial. GET 15 TIMES MORE RESULTS THAN WITH OTHERS. In vitro lab testing shows that less than 4% of the probiotics in most chewables, powders, and capsules survive your child's stomach acids to deliver any benefit. With superior patented technology, 60% of PRO-Kids probiotics will reach deep into your child's intestinal tract where they are needed most. See below to understand the Science behind the Superiority. KEEP YOUR CHILD HEALTHY. 80% of your immune system is in your gut, and when probiotics (the good guys) are abundant in your body, it's harder for the bad guys to settle in. 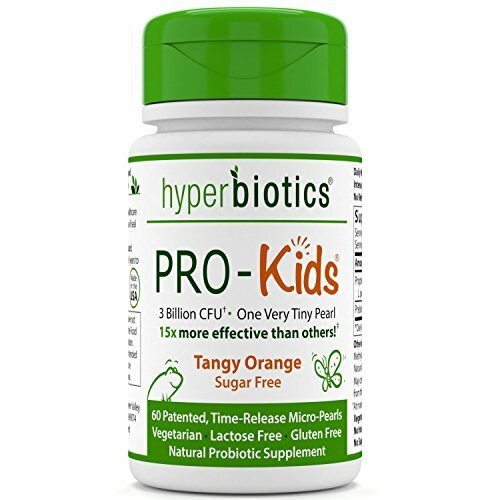 PRO-Kids helps restore your child's beneficial bacteria for optimal digestive and immune health. GIVE YOUR CHILD THE FOUNDATION OF A STRONG IMMUNE SYSTEM. From our modern dietary choices to our daily hygiene regimens, many things can affect the balance of bacteria critical for healthy digestion and immunity. With proper probiotic supplementation, you can help repopulate your child's gut, promote full nutrient absorption and reactivate their natural defenses, giving your child a solid foundation for a lifetime of health. CHOOSE NATURAL & SUGAR FREE. Avoiding the synthetic and sugar-loaded ingredients you know are not beneficial for your child can be quite a challenge! You can rest assured because PRO-Kids is sugar free (sweetened with stevia) and has ZERO artificial colors, flavors, or sweeteners - just a slight natural orange taste. If you have any questions about this product by Hyperbiotics, contact us by completing and submitting the form below. If you are looking for a specif part number, please include it with your message.